I was reading an article on BaseballHQ.com about Post-Injury Best Bets by Dan Becker when I found myself growing annoyed. All the players on the list were listed under an injury that ended their season except one. 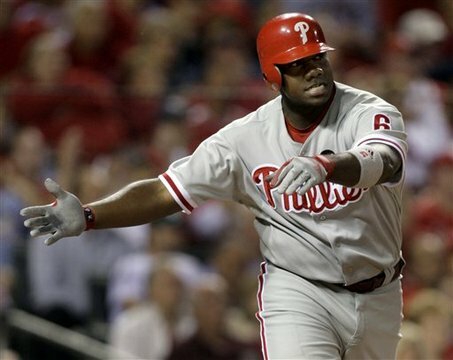 Ryan Howard was listed as a longshot to cover from the injury with which he began the 2012 season. The torn Achilles kept him of out action until early July (rather than the late May that was estimated). But he did return. He broke his toe when he dropped a weight at the end but that should not hold him back much. He was not great upon his return but after several months away a little rust could be expected. But Dan Becker thinks that Howard is not worth investing in for the 2013 season. There were a number of red flags in regards to Howard's declining skills even before he tore his Achilles. Now he's just a bad investment. His slash numbers have wilted across the board since 2009 and he's helpless against LHP. The PX remains terrific so he's likely to remain a nice source of HRs, but at what cost to other categories? It wouldn't be shocking to see Howard enjoy a mild bounce back season, but the decline phase of big sluggers is too ugly to risk for such limited upside. Sure, I know Howard is not the greatest player in the game. He certainly has his share of flaws. He does not have a very good contact rate. He is a slow and lumbering sort of player. He is not a good defensive player. But how much of that actually matters to Howard’s fantasy value? Over his career Howard has averaged a .271/.364/.551 slash with 33-plus homers in his nine major league seasons. In 2011, his last healthy season, he hit .253/.346/.488 with 33 homers and 116 RBI. Is it really so unreasonable that a healthy Howard could repeat that line? He has a reputation as a hard worker who will do what it takes to play the best first base possible and to take his spot in the lineup. He has basically performed like the slightly flawed slugger he is in every season of his career until he was hurt. He does not have any speed he needs to recover. All he really needs is healthy legs and he is good to go. Excluding the 2012 season, Howard has been worth between $23 and $33 every season since 2007. If he looks healthy going into the season, anything less than $25 strikes me as good bet on Howard’s rebound.